Scoliosis is confusing. Let’s be honest—it just is! The problem is, you don’t have time for confusion; you have a scoliosis client and they need help now. You need to properly assess their body, create an engaging lesson plan, and then figure out if that lesson actually helped. How do I know? Because I have scoliosis, and so do most of my clients. I’ve devoted my professional career to studying Pilates, scoliosis, and the benefits of movement. I can help you simplify this whole process, starting with the checklist below. 1. READ The Role of the Teacher blog post. This blog post outlines some broad goals for you. It’s imperative that you know how to quickly analyze a scoliotic body, and this skill takes time to perfect. This post will teach you how to analyze. This blog post will help you understand what research says about a scoliometer and why it’s important to use one. A scoliometer helps measure vertebral rotation. A decrease in rotation is correlated with movement that is good for your client’s scoliosis and helps untwist their spiral spine. 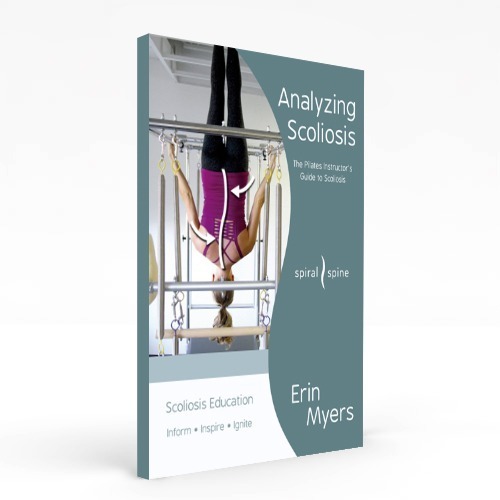 You need to measure your client’s back with the scoliometer at the beginning and end of every session to know if the lesson you just gave helped or hurt their back. If you need a visual on how to use a scoliometer, you can watch the intro video in the Starting Point Series. This chart will help you easily track your client’s scoliometer measurements, and also has a place for notes. Things that are beneficial to note in this column are activities that have affected your client that week (illness, long car rides, lots of lifting, etc. ), exercises that were beneficial, or tight muscles you noticed. You’ll begin to see patterns as to what helps your client’s body unwind the most and what winds it up. This book was written for you, and will teach you many of my own techniques for working with scoli clients. These techniques aren’t learned overnight. Find someone you can practice teach them to. If you need more help, I’ve available for virtual private instruction. Feel free to contact my studio to book a session. You can also take a scoliosis workshop with me.